Due to our change in direction, our route would carry us along a road for most of the day. 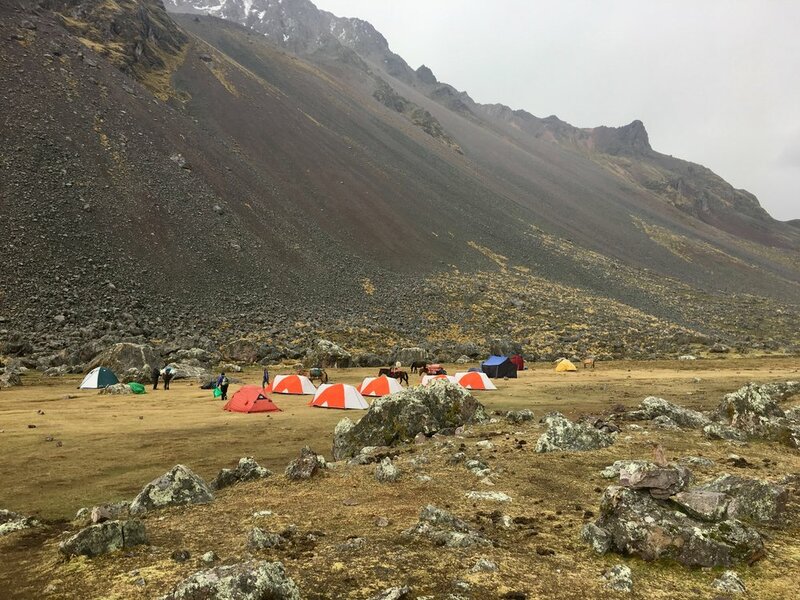 It was a easier stroll through towns and gentler inclines to reach our campsite, Surapampa at 15,088 ft.
For four days I carried pencils, sharpeners, and stickers hoping to see children along our path. Until day 4, these items were deadweight in my pack with little hope for relief. I was so thankful to pass through little towns and encounter some children. To many of the children we encountered, the pencil was cherished as if they’d received a coveted gift. A smile of gratitude on a child’s face is worth the added weight in a backpack. The sites along the trail continued to amaze and cause us to struggle for words. Thankfully we were able to sit and take in the views. We rolled into camp right before the sky unleashed its, now normal, afternoon hail and rain combination. A few of use took cover in the dining tent, but that appeared to be a bad idea, as we ended up holding it together so the winds didn’t remove our shelter. Dining tent holding relief came and we retreated to a sleeping tent for a game of Black 7s. Altitude effects were still working on a few of us and made for some interesting side stories as we battled sleeping at 15,088 ft. We would finish the day with about 12 miles hiked and back on the map from our slight detour. This would prove beneficial as we entered Day 5 of our Trek around Ausangate.